I received this photo of the landing upstairs in the Golden North Hotel from a visitor who said he had stayed here in 2001. He said it was a pleasure to sit and read here and talk with the other people staying here. Although the furnishings are all still in place, the hotel no longer hosts guests. Downstairs, the restaurant and bar have been replaced with jewelry and souvenir stores. I have often enjoyed a sandwich and latte at the Glacial Smoothees shop across the street and looked up at that big double window and wondered what was behind it! P.S. It has not been a hotel for many years, the only guests are ones that never checked out……Whoooooooo! So everytime I look at this it seems to SHOUT AT ME!!! The new Junior Ranger center is here – a nice activity for kids. It is on the corner of Broadway and 4th and open Monday-Friday 10-noon and 1-3 p.m.
Fred Fonzo was born in 1859 in Denmark. He married Mary Boyd in the San Francisco Bay area and had two children, Fred Jr. in 1892 in Berkeley and Myrtle. 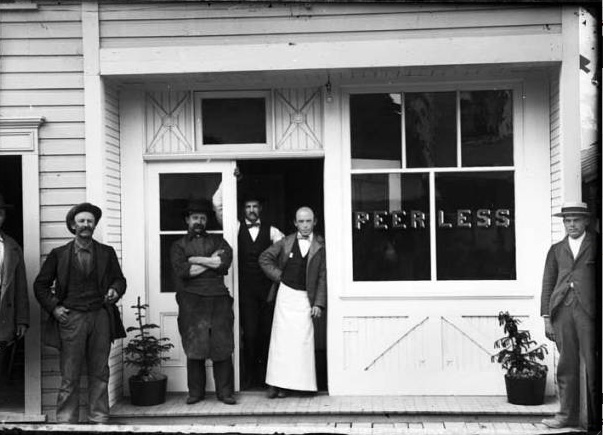 He ran the Acheson Hotel and also worked as a constable in Berkeley. In 1894 his wife died and so he headed north to Alaska. He apparently never bothered to write to the family to let them know where he was. 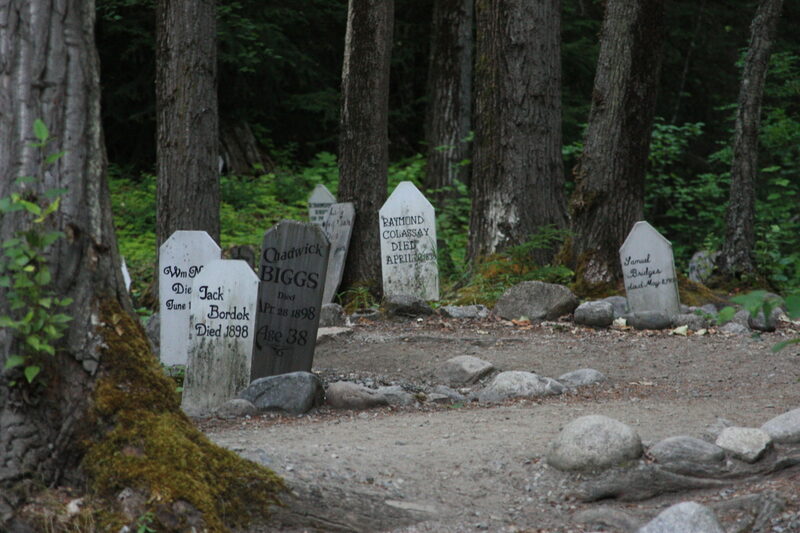 They assumed that he had died, but he appeared in Skagway about 1909 where he worked as the U.S. Jailer and Marshal. On June 16, 1911, while trying to evict Miss Mary Bernhofer from the New Home Hotel, her niece, Lena Bernhofer, aged 16, shot Marshal Fonzo. The bullet pierced his arm and lodged in his chest but did not kill him. However, news of the bullet reached the Oakland Tribune on June 22, 1911 and the family discovered his whereabouts (having mourned him for 17 years). Meanwhile Mary Bernhofer refused to leave the hotel and said she would burn it down and kill herself if evicted. Mary Bernhofer was the hotel proprietor of the “New Home Restaurant & Lodging house” since 1897. 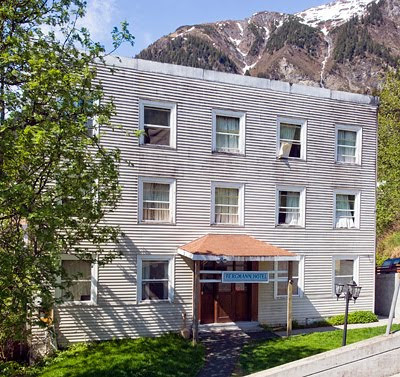 In 1915 she appeared in Juneau as a housekeeper at The Bergman Hotel, but her employer died the next year and so Mary Bernhofer became the manager for many years. This hotel, on 3rd downtown, now a hostel, is still running today, seen above. Fred Fonzo died on this day, June 4, 1927 in Seattle at the age of 68. There is a wonderful story about Rebecca and Solomon Schuldenfrei. Their great great granddaughter tells it best and you can read it in its entirety by following the link below. “Rebecca Schuldenfrei was born in 1863 near Krakow in the Austro-Hungarian empire. At a young age she immigrated to America and lived most of her life in New York. 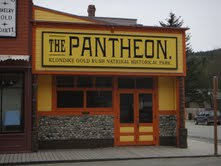 In 1897 her husband, Solomon decided to set out to the Klondike with a business partner in search of gold. As the trip rapidly approached, the partner decided he could not leave his business and backed out. Becci, concerned that her husband was not tough enough for the wilds of the Yukon, would not let him go off alone and decided to come along. The couple had three children and, in a move very uncommon to mothers of her day, Rebecca left them in the care of her sister and joined her husband as a partner on his adventure. Having never lived outside a city, both Sol and Becci had no way of knowing what kind of dangers they faced. They went for practical reasons: Sol’s business had not been very successful, but they must have had some sense of adventure or else they would not have taken all the risks they did. Most of what is known about Rebecca Schuldenfrei comes from the numerous letters she wrote to her sister and her children during the entire trip. Where these letters are quoted, her spelling and grammar is used. Whether what she says is completely accurate or whether it was appropriately filtered for her readers is unknown. What the letters definitely show is an incredible journey of a urban woman in the wilderness of the Yukon. The one curious fact that I had from a different source was that Sol paid the Indian guides $700 to pack their canoe with Rebecca inside of it, over the Chilkoot Pass. What a guy!!! Known as “Jim” Gillespie, he was born in May 1862 in Buffalo, New York of Scottish immigrant parents. He married and had a hotel in Buffalo called the Hotel Gillespie until 1897. 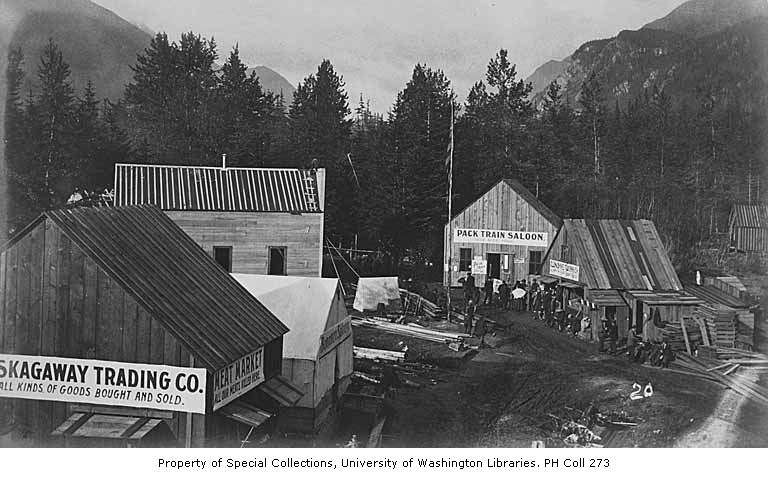 By 1898 Jim got gold rush fever and came to Skagway where he ran a saloon and stayed at least until the census in 1900. Records show that Mrs. Kate Gillespie ran the Buffalo Hotel Gillespie while he was in Skagway, but here he was married to Belle, so perhaps it was his mother or former wife who stayed in Buffalo. 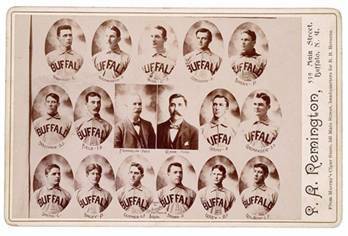 Jim’s other love was baseball and in 1890 he played for one season for the Buffalo Bisons. The Buffalo Bisons were a Major League Baseball franchise based in Buffalo, New York. The team existed for one season, in 1890 and played in the Players’ League. In a fun game in 1890 with the single men vs. the married men, Jim was second base man for the married men. The Bisons played their home games at Olympic Park. Jim played one game in right field for the team. In that game, he had three at bats without a hit and made three errors in four fielding chances. He died June 24, 1926 back in Buffalo. Seen above is the team in 1890. Wish I knew which one was Jim! Joseph W. Nee was born in 1885 in Washington Territory. His parents, John and Maggie were born in Ireland and emigrated about 1869 to Kentucky where their first son was born. After that, based on the kids birthplaces, they moved to Alabama, Florida, Georgia, back to Alabama, Oregon and finally Washington Territory. His father John must have had a bar because in 1886 he was convicted of running a gambling house and having minors present in Lincoln County Washington. Joseph was the 8th living child in 1887. They all must have worked hard on the farm and so, in the gold rush, Joseph, at age 13 helped to run the Hotel and Store at Sheep Camp half way up the Chilkoot Trail. He stayed in the Yukon until 1903. 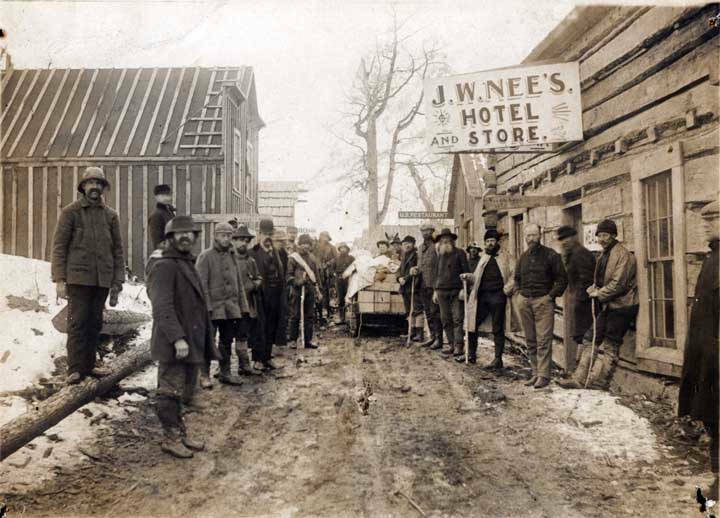 By 1910 he was back in Lincoln County Washington with a general store, a wife, Goldie and two kids. Seen above is the store and hotel, the label says it is Dyea, while other records say it was at Sheep Camp.